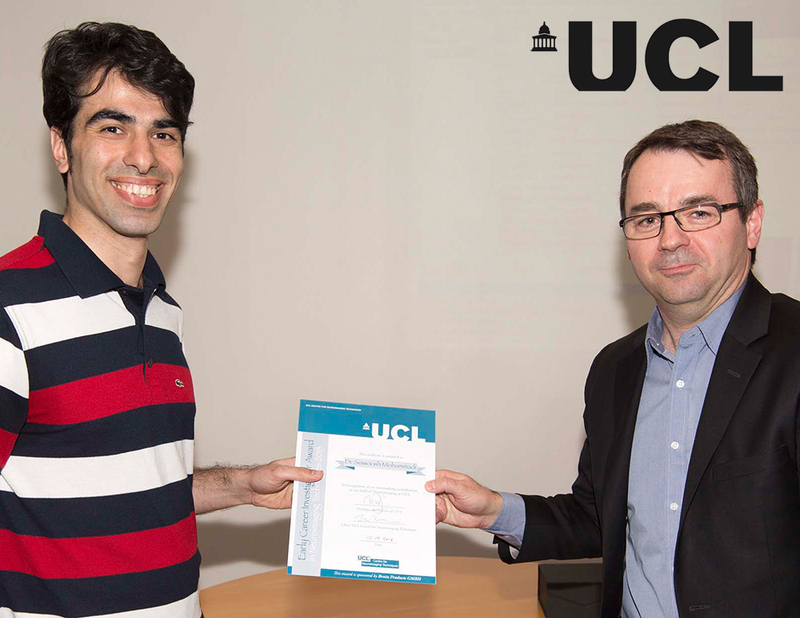 It was with great pleasure that I again attended the presentation of the UCL Centre for Neuroimaging Techniques (UCL CNT) 2013 Early Career Investigator in Neuroimaging Techniques Award on April 17, 2014. This year’s winner is Dr Siawoosh Mohammadi. He is currently working on high-resolution spinal-cord DTI, Kurtosis Diffusion Imaging, and their combination with multi-parameter mapping approaches all topics which were the subject of his winning research thesis. Following is an extract from the candidature statement written by Nikolaus Weiskopf, Head of Physics, Wellcome Trust Centre for Neuroimaging, UCL: “Siawoosh is a postdoctoral research associate within the Physics Group at the Wellcome Trust Centre for Neuroimaging. He has published 7 first author papers in high-quality journals since joining UCL ~3 years ago (out of 30 in total). He has also secured a prestigious postdoctoral fellowship from the German Research Council (DFG) for his personal line of research, which supports his work at UCL.” He has already made a unique and significant contribution to his field and graciously accepted the Brain Products award, which I had the pleasure of presenting. This year 4 candidates were put forward. The evening began with an interesting presentation by Prof. Stephen Smith from FMRIB on the Biobank and Big Data projects which are currently in progress both here and in the US. The prize giving was followed by a very congenial drinks reception to mark the event. I congratulate Siawoosh on behalf of Brain Products GmbH as well as on behalf of the team at Brain Vision UK Ltd.